An optical coherence tomography (OCT) for high axial resolution corneal imaging is presented. The system uses 375 nm bandwidth (625 to 1000 nm) from a broadband supercontinuum light source. The system was developed in free space to minimize image quality degradation due to dispersion. A custom-designed spectrometer based on a Czerny Turner configuration was implemented to achieve an imaging depth of 1 mm. Experimentally measured axial resolution was 1.1 μm in corneal tissue and had a good agreement with the theoretically calculated resolution from the envelope of the spectral interference fringes. In vivo imaging was carried out and thin corneal layers such as the tear film and the Bowman’s layer were quantified in normal, keratoconus, and contact lens wearing eyes, indicating the system’s suitability for several ophthalmic applications. M. R. Hee, J. A. Izatt, E. A. Swanson, D. Huang, J. S. Schuman, C. P. Lin, C. A. Puliafito, and J. G. Fujimoto, “Optical coherence tomography of the human retina,” Arch. Ophthalmol. 113(3), 325–332 (1995). J. A. Izatt, M. R. Hee, E. A. Swanson, C. P. Lin, D. Huang, J. S. Schuman, C. A. Puliafito, and J. G. Fujimoto, “Micrometer-scale resolution imaging of the anterior eye in vivo with optical coherence tomography,” Arch. Ophthalmol. 112(12), 1584–1589 (1994). J. J. Kałusny, M. Wojtkowski, and A. Kowalczyk, “Imaging of the anterior segment of the eye by spectra optical coherence tomography,” Opt. Appl. 32, 581–589 (2002). D. A. Atchison and J. Smith, Optics of the Human Eye (Elsevier, 2002). I. Jalbert, F. Stapleton, E. Papas, D. F. Sweeney, and M. Coroneo, “In vivo confocal microscopy of the human cornea,” Br. J. Ophthalmol. 87(2), 225–236 (2003). R. L. Niederer, D. Perumal, T. Sherwin, and C. N. J. McGhee, “Laser scanning in vivo confocal microscopy reveals reduced innervation and reduction in cell density in all layers of the keratoconic cornea,” Invest. Ophthalmol. Vis. Sci. 49(7), 2964–2970 (2008). R. Leitgeb, W. Drexler, A. Unterhuber, B. Hermann, T. Bajraszewski, T. Le, A. Stingl, and A. Fercher, “Ultrahigh resolution Fourier domain optical coherence tomography,” Opt. Express 12(10), 2156–2165 (2004). M. Wojtkowski, V. Srinivasan, T. Ko, J. Fujimoto, A. Kowalczyk, and J. Duker, “Ultrahigh-resolution, high-speed, Fourier domain optical coherence tomography and methods for dispersion compensation,” Opt. Express 12(11), 2404–2422 (2004). V. Christopoulos, L. Kagemann, G. Wollstein, H. Ishikawa, M. L. Gabriele, M. Wojtkowski, V. Srinivasan, J. G. Fujimoto, J. S. Duker, D. K. Dhaliwal, and J. S. Schuman, “In vivo corneal high-speed, ultra high-resolution optical coherence tomography,” Arch. Ophthalmol. 125(8), 1027–1035 (2007). M. A. Shousha, V. L. Perez, J. Wang, T. Ide, S. Jiao, Q. Chen, V. Chang, N. Buchser, S. R. Dubovy, W. Feuer, and S. H. Yoo, “Use of ultra-high-resolution optical coherence tomography to detect in vivo characteristics of Descemet’s membrane in Fuchs’ dystrophy,” Ophthalmology 117(6), 1220–1227 (2010). N. Hutchings, T. L. Simpson, C. Hyun, A. A. Moayed, S. Hariri, L. Sorbara, and K. Bizheva, “Swelling of the human cornea revealed by high-speed, ultrahigh-resolution optical coherence tomography,” Invest. Ophthalmol. Vis. Sci. 51(9), 4579–4584 (2010). J. Wang, D. Fonn, T. L. Simpson, and L. Jones, “Precorneal and pre- and postlens tear film thickness measured indirectly with optical coherence tomography,” Invest. Ophthalmol. Vis. Sci. 44(6), 2524–2528 (2003). Q. Chen, J. Wang, A. Tao, M. Shen, S. Jiao, and F. Lu, “Ultrahigh-resolution measurement by optical coherence tomography of dynamic tear film changes on contact lenses,” Invest. Ophthalmol. Vis. Sci. 51(4), 1988–1993 (2010). P. E. King-Smith, B. A. Fink, R. M. Hill, K. W. Koelling, and J. M. Tiffany, “The thickness of the tear film,” Curr. Eye Res. 29(4-5), 357–368 (2004). 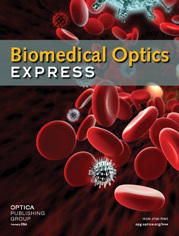 W. Drexler, “Ultrahigh-resolution optical coherence tomography,” J. Biomed. Opt. 9(1), 47–74 (2004). American National Standards Institute, “American national standard for safe use of lasers,” ANSI Z136.1-2007 (2007). B. Povazay, K. Bizheva, A. Unterhuber, B. Hermann, H. Sattmann, A. F. Fercher, W. Drexler, A. Apolonski, W. J. Wadsworth, J. C. Knight, P. S. J. Russell, M. Vetterlein, and E. Scherzer, “Submicrometer axial resolution optical coherence tomography,” Opt. Lett. 27(20), 1800–1802 (2002). Y. Wang, Y. Zhao, J. S. Nelson, Z. Chen, and R. S. Windeler, “Ultrahigh-resolution optical coherence tomography by broadband continuum generation from a photonic crystal fiber,” Opt. Lett. 28(3), 182–184 (2003). G. Häusler and M. W. Linduer, “Coherence radar and spectral radar-new tools for dermatological diagnosis,” J. Biomed. Opt. 3(1), 21–31 (1998). K. S. Lee, K. P. Thompson, and J. P. Rolland, “Broadband astigmatism-corrected Czerny-Turner spectrometer,” Opt. Express 18(22), 23378–23384 (2010). B. Rabbetts, Bennett & Rabbetts’ Clinical Visual Optics (Elsevier 2007). M. Czerny and A. F. Turner, “Über den Astigmatismus bei Spiegelspektrometern,” Z. Phys. 61, 792–797 (1930). B. Shafer, L. R. Megill, and L. Droppleman, “Optimization of the Czerny-Turner spectrometer,” J. Opt. Soc. Am. 54(7), 879–887 (1964). Q. Xue, S. Wang, and F. Lu, “Aberration-corrected Czerny-Turner imaging spectrometer with a wide spectral region,” Appl. Opt. 48(1), 11–16 (2009). W. Drexler, C. K. Hitzenberger, A. Baumgartner, O. Findl, H. Sattmann, and A. F. Fercher, “Investigation of dispersion effects in ocular media by multiple wavelength partial coherence interferometry,” Exp. Eye Res. 66(1), 25–33 (1998). C. K. Hitzenberger, A. Baumgartner, and A. F. Fercher, “Dispersion induced multiple signal peak splitting in partial coherence interferometry,” Opt. Commun. 154(4), 179–185 (1998). C. K. Hitzenberger, A. Baumgartner, W. Drexler, and A. F. Fercher, “Dispersion effects in partial coherence interferometry: implications for intraocular ranging,” J. Biomed. Opt. 4(1), 144–151 (1999). S. Patel, J. Marshall, and F. W. Fitzke, “Refractive index of the human corneal epithelium and stroma,” J. Refract. Surg. 11(2), 100–105 (1995). J. H. Krachmer, R. S. Feder, and M. W. Belin, “Keratoconus and related noninflammatory corneal thinning disorders,” Surv. Ophthalmol. 28(4), 293–322 (1984). W. J. Kim, Y. S. Rabinowitz, D. M. Meisler, and S. E. Wilson, “Keratocyte apoptosis associated with keratoconus,” Exp. Eye Res. 69(5), 475–481 (1999). J. T. Coyle, “Keratoconus and eye rubbing,” Am. J. Ophthalmol. 97(4), 527–528 (1984). M. S. Macsai, G. A. Varley, and J. H. Krachmer, “Development of keratoconus after contact lens wear. patient characteristics,” Arch. Ophthalmol. 108(4), 534–538 (1990). A. Rahi, P. Davies, M. Ruben, D. Lobascher, and J. Menon, “Keratoconus and coexisting atopic disease,” Br. J. Ophthalmol. 61(12), 761–764 (1977). R. J. Harrison, P. T. Klouda, D. L. Easty, M. Manku, J. Charles, and C. M. Stewart, “Association between keratoconus and atopy,” Br. J. Ophthalmol. 73(10), 816–822 (1989). B. E. Caffery, D. Richter, T. Simpson, D. Fonn, M. Doughty, and K. Gordon, “The prevalence of dry eye in contact lens wearers: part 2 of the Canadian Dry Eye Epidemiology study,” Invest. Ophthalmol. Vis. Sci. 37, S72 (1996). M. J. Doughty, D. Fonn, D. Richter, T. Simpson, B. Caffery, and K. Gordon, “A patient questionnaire approach to estimating the prevalence of dry eye symptoms in patients presenting to optometric practices across Canada,” Optom. Vis. Sci. 74(8), 624–631 (1997). G. T. Timberlake, M. G. Doane, and J. H. Bertera, “Short-term, low-contrast visual acuity reduction associated with in vivo contact lens drying,” Optom. Vis. Sci. 69(10), 755–760 (1992). R. Tutt, A. Bradley, C. Begley, and L. N. Thibos, “Optical and visual impact of tear break-up in human eyes,” Invest. Ophthalmol. Vis. Sci. 41(13), 4117–4123 (2000). T. Hayashi and I. Fatt, “A lubrication theory model of tear exchange under a soft contact lens,” Am. J. Optom. Physiol. Opt. 53(3), 101–103 (1976). L. Wagner, K. Polse, and R. Mandell, “Tear pumping and edema with soft contact lenses,” Invest. Ophthalmol. Vis. Sci. 19(11), 1397–1400 (1980). S. A. Little and A. S. Bruce, “Postlens tear film morphology, lens movement and symptoms in hydrogel lens wearers,” Ophthalmic Physiol. Opt. 14(1), 65–69 (1994). Fig. 1 The spectrometer PSF for two wavelengths separated by the required spectral resolution calculated from Eq. (1) for (a) 625 nm (b) 700 nm (c) 800 nm (d) 900 nm (e) 1000 nm. Fig. 2 Spectral resolution predicted by ray tracing compared with the required spectral resolution. The spectral resolution requirement is satisfied by all wavelengths except between 625 nm and 690 nm. Fig. 3 Full schematic of the OCT system. C, Collimator; BF, Bandpass filter; BS, Beamsplitter; VND, Variable neutral density filter; SM, Scanning mirror; OL, Objective lens; S, Sample; M, Reference mirror; FL, Focusing lens; CM1, First concave mirror; G, Linear grating; CM2, Second concave mirror; CL, Cylindrical lens; D, Linescan CCD. Fig. 4 (a) The axial PSF of the OCT measured experimentally by a mirror in the sample arm shown in blue, the PSF estimated theoretically from the envelope of spectral interference fringes shown in dashed red. The FWHM of the axial PSF is estimated to be 1.52 μm in air which corresponds to 1.11 μm in corneal tissue. (b) Sensitivity roll off of the system evaluated by measuring the axial PSF at different depths. Fig. 5 The images obtained for the photoresists (n = 1.6) of thickness (a) 0.91 μm (b) 1.36 μm (c) 3.37 μm and (d) 4.40 μm and the peaks for photoresist thickness of (e) 0.91 μm (f) 1.36 μm (g) 3.37 μm and (h) 4.40 μm. Fig. 6 OCT image of the cornea of a normal patient. TL: Tear Layer, EP: Epithelium, BL: Bowman’s Layer, SR: Stroma, DM: Descemet’s Membrane, EN: Endothelium. Fig. 7 OCT images of (a) Normal (same image shown in Fig. 6), (b) moderate keratoconus (c) severe keratoconus. Fig. 8 (a) Image of the contact lens wearer's cornea immediately after instilling a tear drop, where the subject was wearing the contact lens for three minutes. (b) Zoom-in view of the PLTF: two interfaces can be clearly visualized. (c) Zoom-in view of the PoLTF: two interfaces are distinguishable.